So one of the things that the BOY and I have been figuring out is adjusting to a new schedule. We adapted when I started my new full time job in December, but then shortly after he began winter break. Now, it’s a new semester with a new schedule and that changes meal planning. Especially since the BOY had 2 night classes this semester, which means 2 nights that I am on my own. The other thing going on this week is we are back in extreme temperatures with cancellations, cold cars, and frost bite warnings. Even the BOY’s law school classes got canceled today and tomorrow. The good thing about today is that after a busy, rather sleepless but super duper fun, weekend, I had a quiet Monday. I was so tired that my eyes were closed and I was passed out with Cooper on my face (no joke!) last night at 9pm. I slept blissfully until after 8am this morning, at which time Cooper returned to pouncing on me. The BOY got dressed and headed off to work. I made some breakfast and threw the first of 2 recipes into the crockpot, trying to avoid hitting a curious Cooper with my knife. This recipe for Sweet Potato and Lentil Curry is really easy and was in the crockpot before 9am. So I had some time to warm up before having to leave the house. I had an 11am workout scheduled with my new trainer. As I was getting out of the car, I realized that I totally forgot my shoes. After 2 days of yoga, I didn’t even think about bringing along gym shoes. My trainer is creative and it worked out just fine. My arms were tired after this weekend and we worked my back hard. I’m hoping for improved posture! I had to make a return at the mall, so I decided to try Protein Bar for lunch. I’ve heard wonderful things about this place from everyone who gets to go there in the city. I was excited that we finally got one in the suburbs and extremely impressed with my Spinach and Pesto Quinoa bowl for lunch! I braved the mall (filled with kids since there is no school today) to make my return and in the mean time picked up a few pieces of Gap Fit workout wear on sale (including running capris for only 15$). When I got home my lentils were soft and fragrant. I made this for lunch for the week ahead, and it was a quick turn around as packaged away the lentils and threw tonight’s dinner into a cleaned crockpot. Cooper and I then curled up for an hour and a half nap before having just enough time to get ready and head out the door for tonight’s tennis lesson. It was hard to determine if it was still on, but I was excited to find out that we were. I think I’ve learned a thing or 2 and am getting maybe a wee bit better…maybe! Tonight was cold but fun and I learned how to serve, which is exciting! We came home and had dinner (recipe coming tomorrow) before relaxing back on the couch with some tea and a new TV show called Black Sails. Has anyone seen it? The BOY is off tomorrow and I am crossing my fingers once again that my car starts. The brutal cold has already rolled in and we can hear the wind howling through the trees. We have plenty of warm food for the week ahead…perfect to beat any case of the Mondays! How do you survive Mondays? Cooper’s Answer: With warm, cozy naps! Spray your crockpot with cookie spray. Add in potatoes, onions, and lentils to crockpot. Stir together stock, ginger, and curry paste until well combined. Pour over sweet potato mixture and stir. Set crockpot to high for 4-5 hours or low for 7-8 hours. People are always shocked to hear that I eat quinoa for breakfast. I mean, I don’t eat it every morning, but as this post shows, there is no meal (including dessert) that quinoa can’t participate in. For the people who are curious along with surprised, I often share with them this recipe. Last night as I was pulling it together (you can prep ahead to save time in the mornings), it occurred to me that my bananas weren’t ripe enough. Like that ever happens…usually I am overloaded with overripe bananas (hence all of the banana bread). 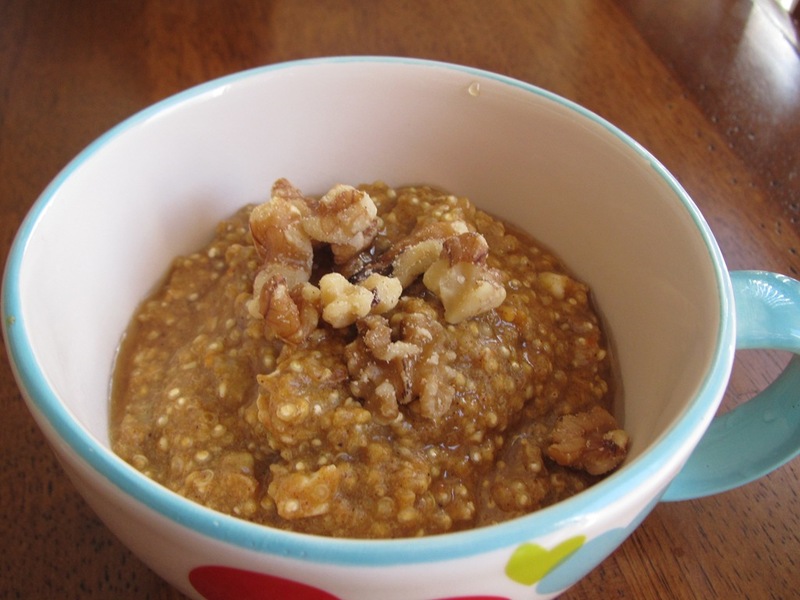 I knew that I could follow the recipe without banana, but that the nuttiness of the quinoa needed a little something sweet to balance the flavor. The only thing available in my house was some natural applesauce, so I decided to give it a go. I also added in apple pie spice and then placed my concoction in the fridge overnight. This is totally not necessary but helps speed things up in the morning. This morning, it took just 3 minutes and breakfast was ready. I topped my quinoa cake with almond butter which was delicious (although not so colorful). It was quite a filling breakfast that kept me moving almost until lunch (my stomach started growling around 11:30am), which was only slightly embarrassing. The Baked Apple Breakfast Quinoa was good, but my favorite remains the banana! Although if my bananas are still green, this will make a good stand in for tomorrow’s breakfast. Do you eat quinoa for breakfast? What’s your favorite recipe? Combine all the ingredients in a microwave safe bowl. Stir well. Microwave for 3 minutes until center is set and cake like. Top with jelly, nut butter, coconut, maple syrup, etc. I’m back on a quinoa kick! I blame the HUGE Costco sized bag about to expire in my pantry and the quinoa filled recipes spreading across the blog world! This morning, I whipped up a pan of cooked quinoa. 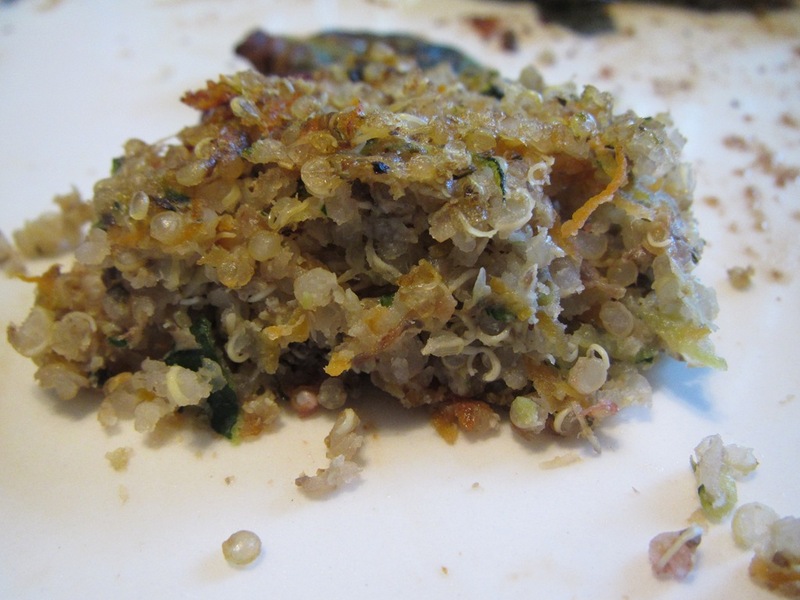 If you are new to quinoa, you can find cooking instructions here. Once you have a large pot of cooked quinoa, the possibilities are endless! I’ve had this recipe for pancakes from Everyday Food tucked away from a few years ago, yet I’ve never made them. I rediscovered it flipping through my recipe binder this morning searching for a Sunday Pancake Day worthy recipe! Sadly, my pancakes never quite stack up quite as nicely as the Door County rock piles. Despite their odd shape, the pancakes, served drizzled with agave and sprinkled with diced strawberries, were awesome! I’m a huge fan of a breakfast that will fuel you through your morning (in today’s case…that was Hot Yoga). Since quinoa is packed with protein, these pancakes are satisfying and filling! When I walked out of yoga, the rain was coming at me horizontally. It’s amazing how (almost) overnight, the neighborhood started to look like fall! Make chili! Have you ever tried quinoa chili??? I have seen a few different quinoa chili recipes on the web, and this one from Manifest Vegan definitely caught my eye. I followed the recipe as written, but ended up with a much soupier version than I expected. I added in some extra white beans and quinoa (since I had it), and then skimmed off about 2 cups of liquid. The result was a thick and flavorful bowl of heart warming chili. I diced up some avocado and crumbled some crackers to make a hearty and fulfilling lunch. The chili was delicious! The perfect combination of fall flavors with some pumpkin spiciness! Does anyone else’s kitchen look like this on Sunday afternoon? Slightly embarrassing…I know! I must say that by the time my chili cooled off, it had thickened up quite a bit, but I would still decrease your liquid (as seen in the NOTE below) for a thicker chili. As I am housesitting and heading back into class for the week (this is the last week and then I will have my certification), I am thrilled to have lunch for the week. This is a new household favorite! A must try!!! Which leads me on to the last, but not certainly not the least exciting quinoa recipe, Quinoa Cocoa-Nut Cookies. I have had this recipe for about a year, but I’ve never actually made it as written. Instead, I modified it to make these Afternoon Energy Bars. With a tornado warning raging at our back door, I had the full hour to let the cookies sit in the oven. And it was well worth it! These healthy cookies are fabulous! They will store in your fridge or freezer for up to a week! And even though they are considered ‘cookies’, these make a super healthy snack. Or, my plan is to freeze them to bring to my classmates for breakfast on Friday (along with this tasty bread). One food really goes a long way! Everything, the pancakes, chili, and cookies can all be frozen for a later date, so cook and bake away while planning to share with friends or freeze for later. CLICK HERE for more Quinoa Love! What is your favorite quinoa recipe? Links Welcome! In a medium bowl, whisk together quinoa, flour, and baking powder. In another medium bowl, whisk together egg, milk, and cinnamon until smooth. Add egg mixture to flour mixture and whisk to combine. Lightly coat a large nonstick skillet or griddle with butter and heat over medium-high. Drop batter by heaping tablespoonfuls into skillet. Cook until bubbles appear on top, 2 minutes. Flip cakes and cook until golden brown on underside, 2 minutes. Wipe skillet clean and repeat with more melted butter and remaining batter (reduce heat to medium if overbrowning). Serve with maple syrup and fresh fruit or preserves if desired. Place the onion, garlic, and red pepper along with the olive oil and sea salt into a large stock pot and sauté over medium-high heat until the peppers are tender, about 10 minutes. Stir often to prevent burning. Add in the spices, carrot, pumpkin puree and vegetable broth and simmer over medium heat for 11 minutes. Stir in the cannellini beans, coconut milk and quinoa and simmer an additional 5 to 10 minutes, or until heated through and thickened slightly. Fold in the scallions and then top each individual serving with ample avocado and cilantro. Let cool about 15 minutes before serving; the chili will thicken about standing. Important Note: I followed the recipe as written and ended up with way too much liquid. I was able to add some quinoa and beans, but still needed to skim off some of the liquid. I would recommend using 3 cans of beans and only 2 cups of vegetable broth. Preheat the oven on its lowest setting. For me, this was 170 degrees. Store in fridge (or freezer) and consume within a week. Have you ever just wanted to spend an entire day sitting on your couch catching up on the hours of drama recorded on your DVR??? In part, I blame this heart warming breakfast that made me want to curl up with a cup of tea and never leave the house. But I also blame the long list of new shows piling up on my TV. It sounded like a fine idea to spend the day indoors in my PJ’s. But after 2 dramatic hours of Grey’s Anatomy, the gorgeous fall weather finally lured me out of the house. It was a picture perfect fall day, which was what REALLY got me out of the house and onto the path for a run. Once I started I was immediately happy to be off the couch. It felt amazing to be out in this beautiful day! I was so excited that I decided to up the ante a bit on my run. In order to meet my 1/2 marathon PR goal and rev up my lazy metabolism, I pulled out a workout from my past, 90/90 second intervals. I used to HATE this run during high school cross country…it was tough! But I was reading AGAIN last night about the importance of high intensity interval training. This time it was in regards to bone density and metabolism in your 30’s. I started with a 5 minute warm up and then ran 90 second intervals alternating between a relaxed pace and a push pace (not quite a sprint, but faster than you want to be running). And, it was just as hard as I remember, especially when I kept hitting the inclines during my push pace. But after a 46 minute run, I felt incredible. It might have been all the cheering and energy from Sunday’s marathon. And the fact that it was one of my fastest runs since breaking my toe. I think that my new Birthday socks helped pump me up too! By the end of my run, I was reminded about the importance of speed and interval training, especially if I want to increase my mile times. I am familiar with tempo runs and negative splits, but looking for other training suggestions. What techniques do you use to increase your speed??? I found this recipe this weekend while I was cruising through blogs. With a Costco sized bag of quinoa in the pantry, it seemed like the ideal Monday breakfast. It wasn’t until after I dumped the pumpkin into the saucepan that I realized I was supposed to add that later. Ooops! All ended well, but I would say that this probably caused an increase in cooking time to closer to 20 minutes. The recipe serves 2, so I had a hot off the stove breakfast yesterday, covered in walnuts with a drizzle of agave, and leftovers for breakfast this morning, which was just as tasty! There is nothing like a power packed breakfast to get your day started right! Combine quinoa, milk, mashed banana and egg whites in a pan on medium heat. The BOY took his last final on Monday and immediately hit the city with his law school friends in celebration! Although he asked me to join him, I had had a busy day of personal training and acupuncture (along with laundry and all of the other things that didn’t get done while I was in class Saturday and Sunday). Since I knew that I was on my own for dinner, I was psyched for a meatless Monday. When I got back from my appointments, I was starving and although I didn’t have a specific recipe for dinner, I had lots of fresh produce and grains that I knew I could turn into a filling dinner. I drew inspiration from the Whole Foods sweet potato quinoa burgers when ‘creating’ this meal. I shredded up a whole bunch of veggies and stirred them into cooked quinoa topped with dried cranberries. I wasn’t sure what to do regarding spices, so I went with the basics (basil and sea salt) and added in a few of my new Spice House finds. To hold the mixture together, I stirred in egg whites and formed 6 patties. I baked them in the oven for ~ 15 minutes, flipping one time. Meanwhile, I roasted up some veggies as a side. Not all of my burgers fell apart, but even the ones that did, tasted great! Everything came together to make an incredibly tasty and filling dinner. The burgers have a strong veggie flavor and the basil is the perfect compliment. And the leftover burgers (although not in true burger form) were just as tasty for lunch the next day! Stir together your veggies, quinoa, and spices. Stir in 2 egg whites. Form into 6 burgers and bake at 375 degrees for 15 minutes, flipping once, until starting to brown on the top. ***This recipe is a work in progress and forgiving! Get creative and have fun! PS I would definitely add in some sweet potato next time too! Using my leftover cranberries from this weekend’s Cranberry Walnut Bread crumbs has been an easy task. I decided to add these nutritional powerhouses to yesterday’s breakfast. I was motivated by this Hot Breakfast Banana Quinoa to make a Banana Quinoa Cake with Cranberries. I combined the cooked quinoa, egg, mashed banana, flax, cinnamon, and cranberries in a microwave safe bowl. Three and a half simple minutes later, I had a warm and hearty breakfast! Covered in peanut butter, this breakfast was divine. The warm cranberries ‘pop’ in your mouth and who doesn’t love warm gooey peanut butter?! It was loaded with protein which was perfect as I headed off to meet the trainer for a strength session. Combine all ingredients in a microwave safe bowl. Stir well to combine. Microwave for 3.5 minutes. Cool slight,remove from bowl, and enjoy warm! Optional: decorate with your favorite nuts, jams, maple syrup, fruit, nut butters, etc. I don’t need to go into all of the details, but last night involved a new Mexican restaurant, the local townie bar, and ended way too late with some wine and Mario Cart. I didn’t set an alarm this morning, which was delightful. When I finally dragged myself out of bed, it was close to 10AM. 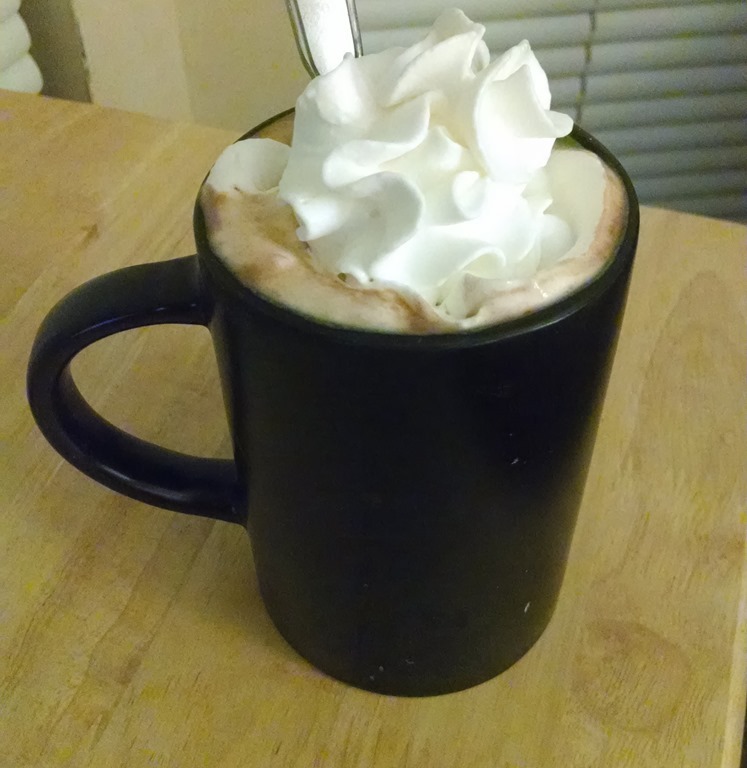 I was in need of a hot caffeinated beverage! 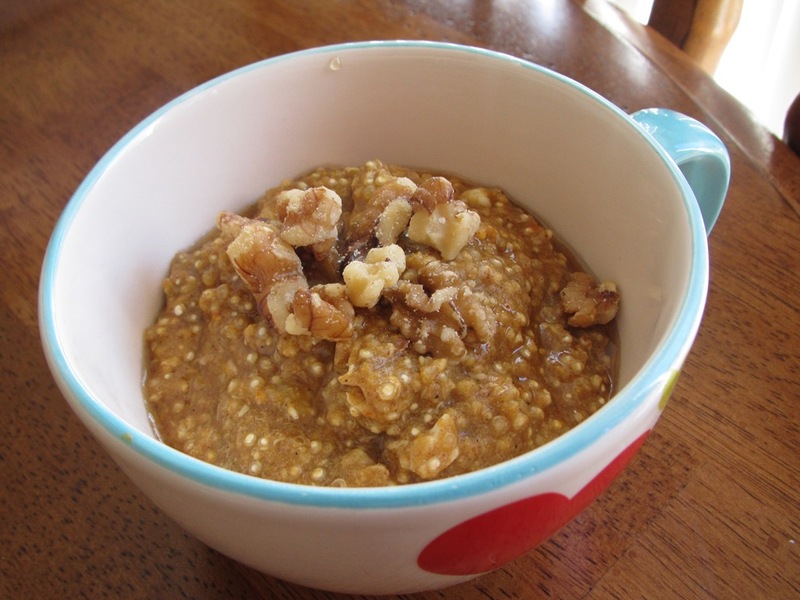 I was inspired by yesterday’s breakfast success, to make another hot quinoa breakfast. With little prep and a quick cooking time, it was the perfect breakfast for this morning. Instead of sweet potato, I used banana and added in some flax seed. I am so impressed with how good this breakfast tastes! Not to mention, how fun it is to eat! What a great way to start a lazy day! Although I have a long list of things to do, including a workout and a pre-Vegas pedicure, we’ll see how much actually gets done. Ahh…the joys of Sunday!!! What is your favorite thing about Sunday? Combine all ingredients well in a microwave safe bowl or ramekin. Microwave for 3 minutes or until cake like and the middle is set. Let cool slightly before eating. Top with all of your favorite nut butters, fruit, syrup, etc.